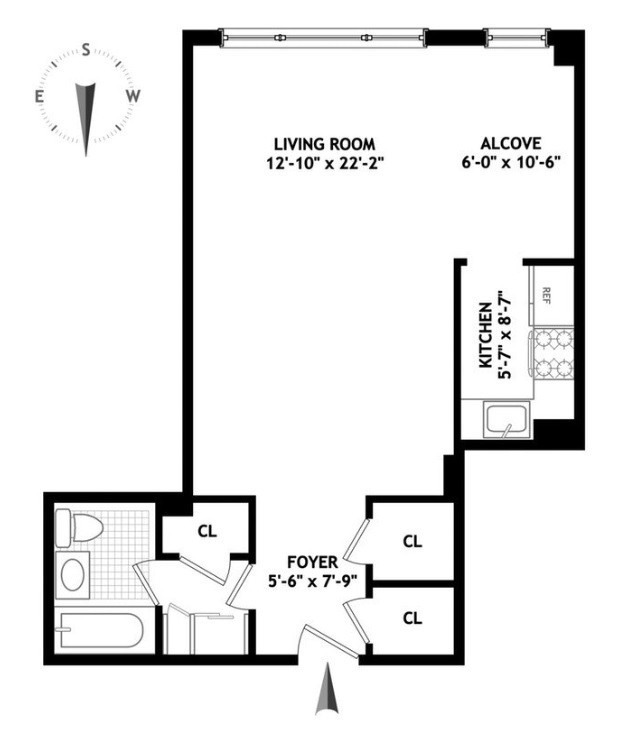 The Murphy bed is in an alcove next to the kitchen. Not everybody loves a Murphy bed. 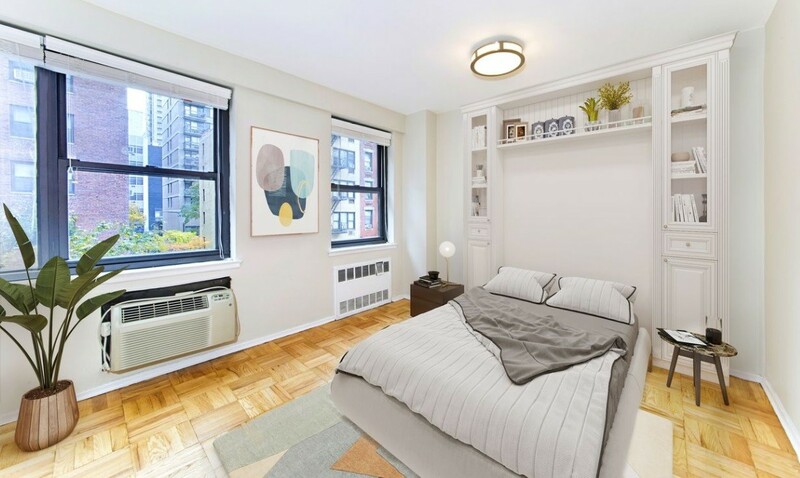 But if you like getting some extra space when the bed is tucked into the wall far and you don't mind having to pop that bed back into place each morning, you should check out this Upper East Side studio, 405 East 63rd St., #3G. 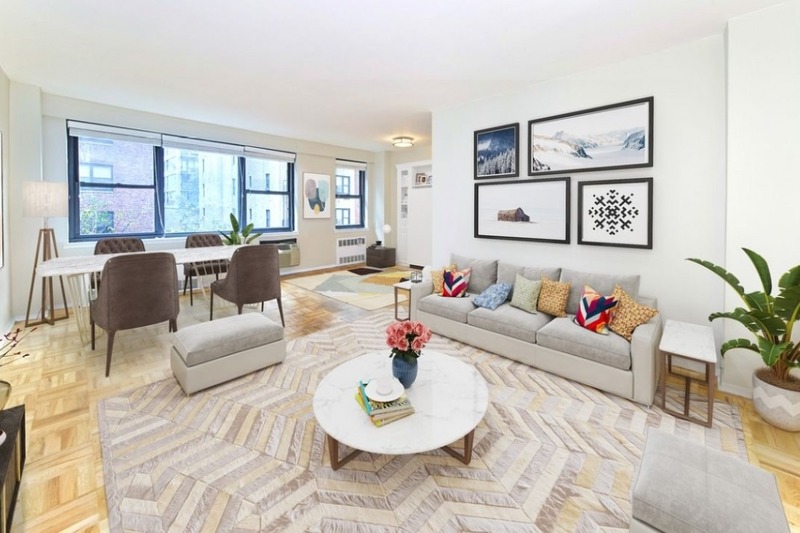 Other advantages of this co-op apartment, which is listed for $399,000, include three closets, recent renovation work in the kitchen and bathroom, and a separate dressing area that could potentially be used as a (small) home office. Large windows in the south-facing living area give the space a lot of light. There are white walls and light parquet flooring to keep things bright. The current set-up includes a seating area with a couch and a coffee table, and a dining table that seats four, but looks like it can easily hold six or possibly eight (if smaller chairs are used). 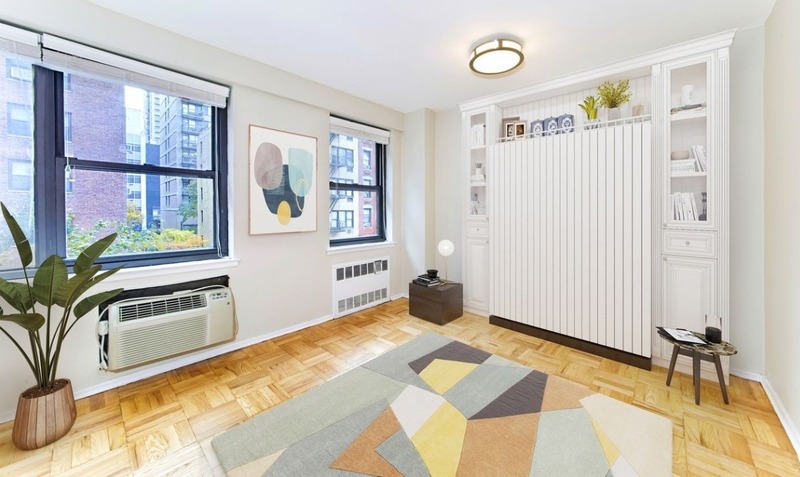 The Murphy bed is in the corner of the room, in an alcove that could easily be cordoned off with a curtain or a screen for anyone who’d prefer a more private sleeping space. It’s a good size—at least a full or queen—and the white wood makes it pretty unobtrusive when it’s closed. The shelves on either side are nice too—a great place to display books, photos, or tchotchkes. 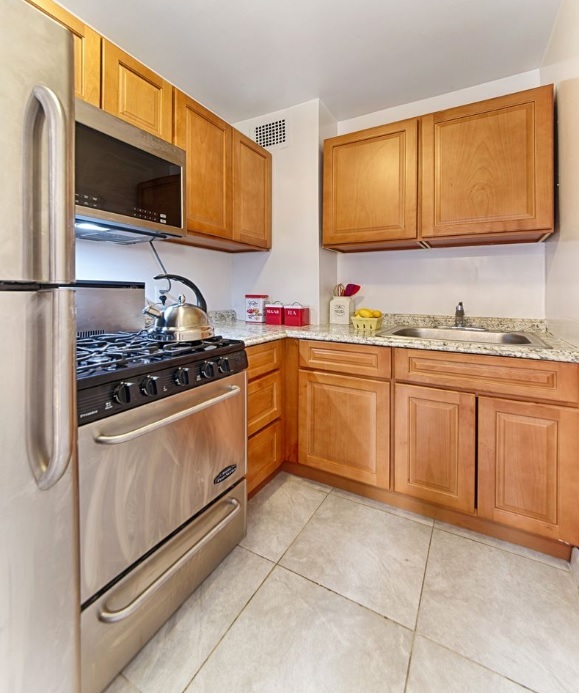 The kitchen is small, but has been redone, and has stainless steel appliances, a number of wood cabinets (for a space this size), and easy-to-clean, large-scale tile flooring. There’s very little in the way of counter space, though, so prepping and cooking a meal in here might be tough. 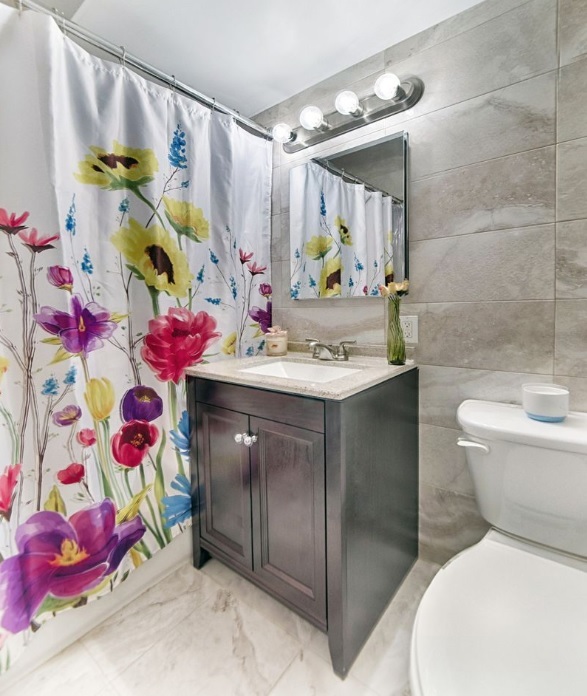 The revamped bathroom is also lovely, with light gray walls that match up nicely with white floors that are flecked with gray, a big vanity, and a vibrant floral curtain that adds a nice splash of color to an otherwise gray room. (Of course, those who’d prefer something a little less flamboyant could easily replace the curtain). Just outside that bathroom is a small room that can be used as a dressing area or perhaps reconfigured into a small home office. 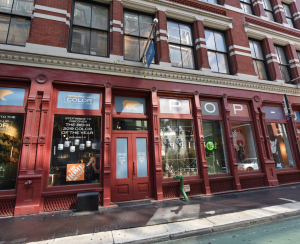 The studio is in a pet-friendly, full-service co-op building with a full-time doorman, live-in super, on-site garage, bike room, storage room, laundry room, and landscaped roof deck. 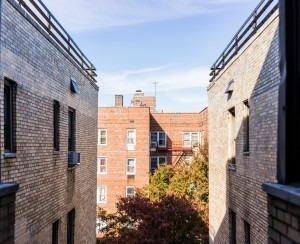 Guarantors, gifting, co-purchasing, pieds-à-terre, parents buying for/with their children, and subletting are all permitted. Maintenance is $1,165 a month. 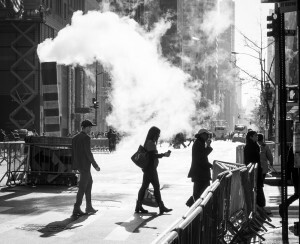 It’s a 10-minute walk to the Lexington Ave.-63rd St. station, where you can catch the F and Q trains, and the pedestrian bridge to the East River Promenade is just down the street.